As you renovate an existing room in your home or put up an addition chances are good you will use Sheetrock to cover the inside of the wood framing. Typically where two different sheets of Sheetrock come together there is an uneven match. Another cause of unevenness would be if the screw or nail was not pushed into the sheet rock flush. In either case you can make it all look smooth with some time, effort and joint compound, also known as mud. Inspect the areas where the Sheetrock is either nailed or screwed into the framework for any signs of unevenness. Run the spackeling knife's flat side along the wall. If you hear a clicking sound of metal touching metal then a nail or screw is sticking out. Hammer the protruding nail flush with the sheet rock with the drywall hammer. If it is a screw, use the screwdriver to screw it in flush. Cut away any uneven material at the joints of the sheet rock with the utility knife to make the surface as smooth as possible. Open the container of the premixed compound and scoop out enough with the spackling knife to fill half the mud pan. 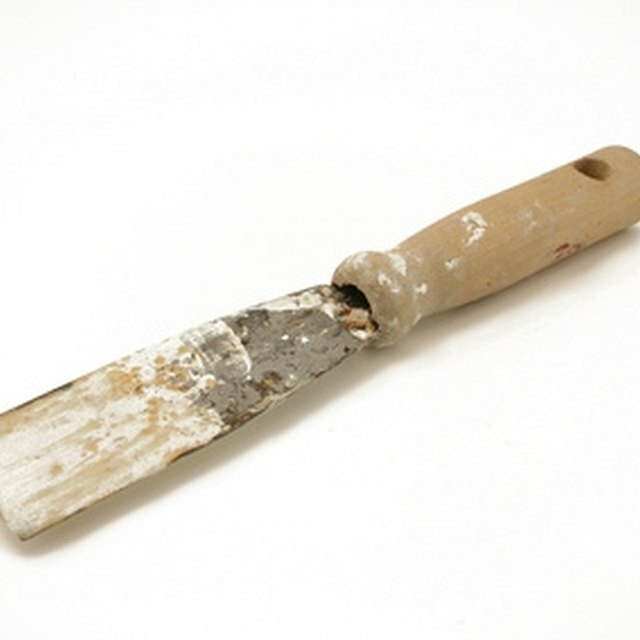 Spread a 1/8-inch thick layer of mud at the Sheetrock joints. Repeat the same at the points where the nails or screws have been inserted connecting the sheet rock to the wood framework. Smooth the surface with the flat edge of the spackel knife. Allow to dry for approximately four hours or more. Test the mud to see if it is completely dry by touching it with your finger. If completely dry, sand any rough edges of the mud with the 80-grit sandpaper. Vacuum any debris from your sanding with a vacuum hose.